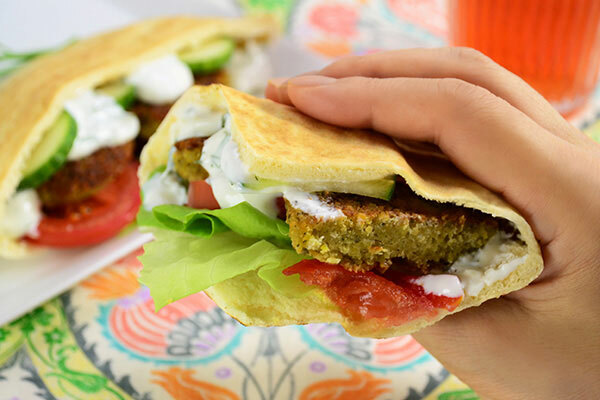 Falafel is a popular Middle Eastern dish made of fava beans and/or chickpeas, usually rolled into a ball and deep fried. 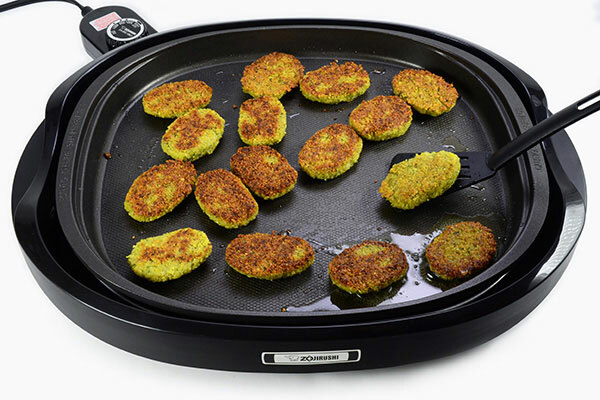 We tweaked the recipe and grilled them into sandwich patties using our Gourmet Sizzler® Electric Griddle (EA-BDC10)! 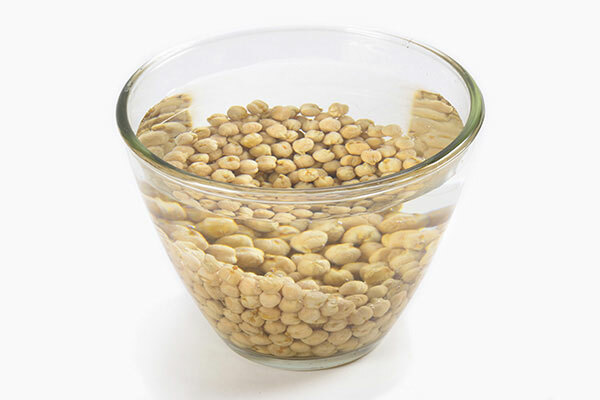 Place chickpeas into a large bowl and soak in about 3 cups of cold water (not in the ingredients), for at least 8 hours. 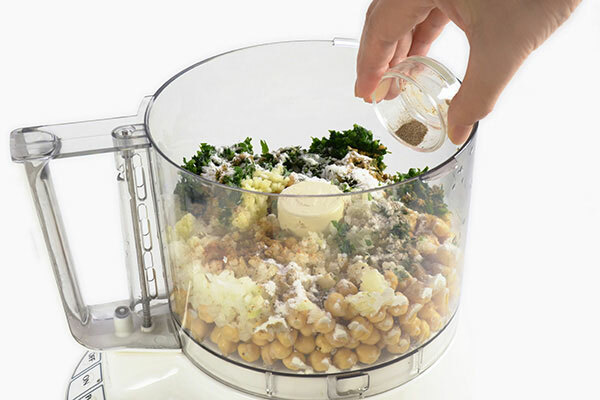 Drain beans well and place them into a food processor. 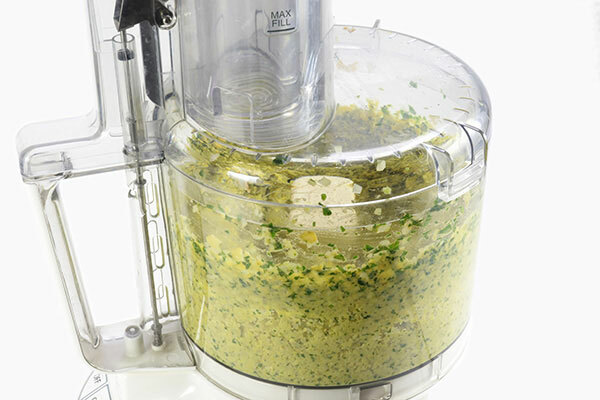 Add remaining ingredients for falafel patties except vegetable oil to the food processor. Pulse all ingredients together until rough-coarse meal forms. Scrape sides of the processor periodically. Pulse until medium-coarse texture. 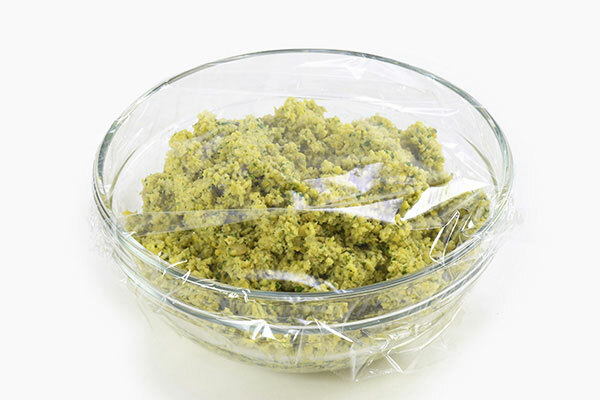 Transfer mixture to a bowl, cover with plastic wrap and refrigerate for 1-2 hours. Make the yogurt sauce. 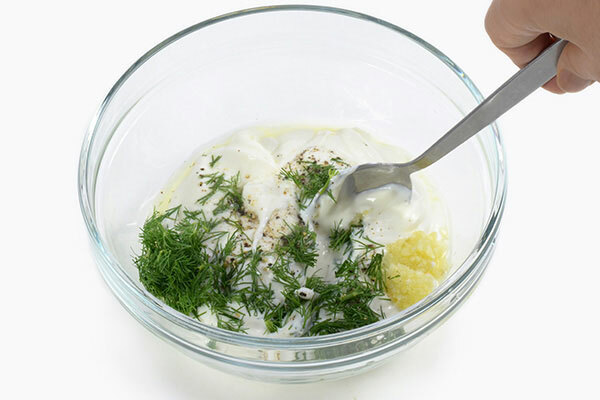 In a bowl combine all ingredients for yogurt sauce. Cover and refrigerate until use. 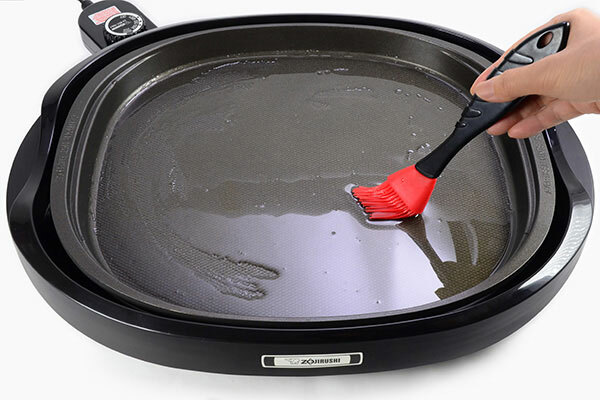 Spread vegetable oil onto the Gourmet Sizzler® Electric Griddle (EA-BDC10). Make the patties. 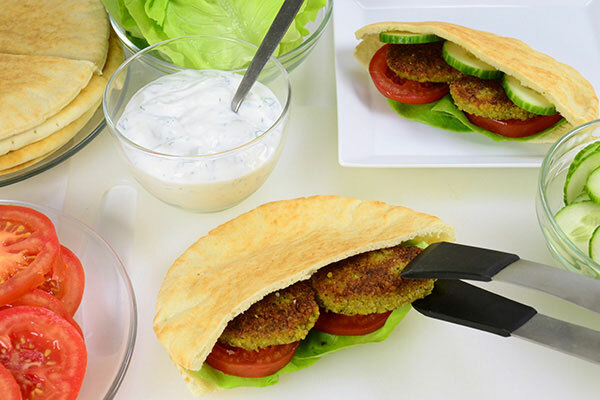 With wet hands, take 2 tablespoons of falafel mixture from step 4 and form into an oval shaped patty. 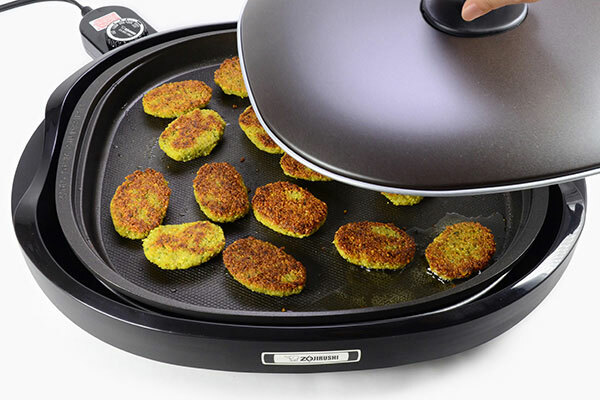 Place each patty on the Gourmet Sizzler® Electric Griddle as you make it. Repeat step to make 15 more patties. 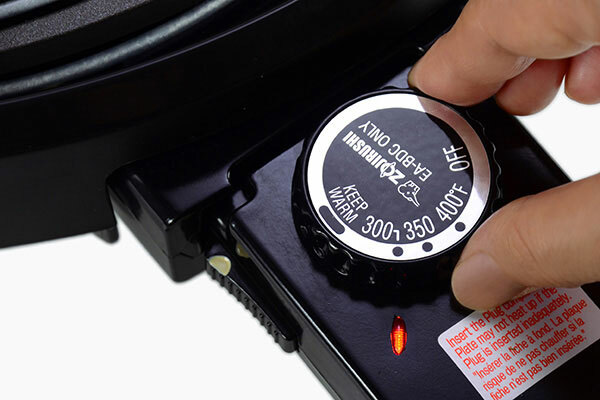 After placing all patties on the griddle, cover with lid and turn the control knob to 300°F. 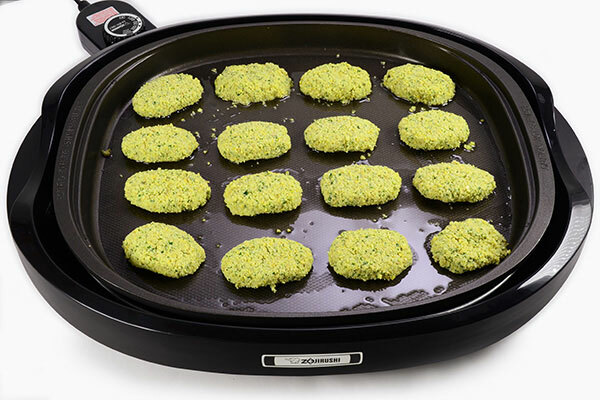 When they begin to sizzle, about 5 minutes after the operation lamp turns off, check the bottom of the patties to see if they are golden brown. Flip the patties, place lid back and cook for another 5 minutes or until both sides are golden brown. Turn heat off. Assemble the sandwiches. 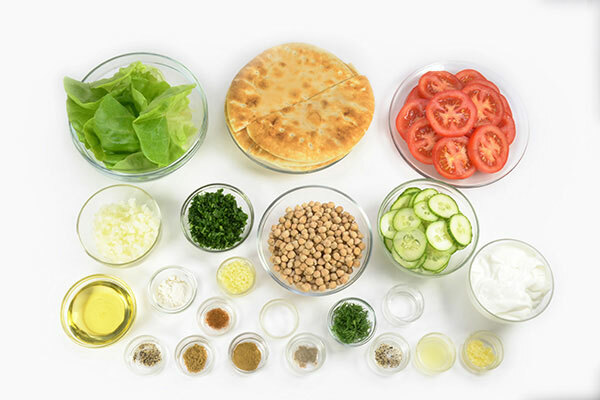 Place 1 lettuce leaf and 2 slices of tomatoes inside one half of a pita. 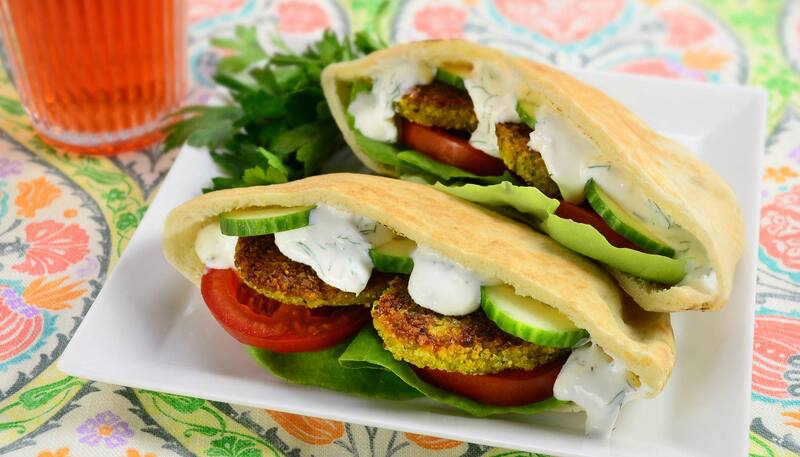 Place two falafel patties, sliced cucumber inside and top with yogurt sauce. Repeat step to make 7 more sandwiches.